If the beginner recipes in my last post look boring to you, you're probably ready to become an experimental, in-season chef. Most cookbooks are chock full of fascinating recipes...which call for ingredients from three different seasons per dish. Here are my intermediate tips for learning to cook in season. First, start with the ingredients. Rather than saying, "I feel like lasagna tonight," take a look in the garden and see what's ripe. Our recipes at the moment revolve around snow and sugar snap peas, new potatoes, eggs, broccoli, greens, basil, and parsley, which is why we've been making meals like pesto pasta with balsamic vinegared greens and a fried egg on the side. Once you know what you're cooking with, head to one of the recipe websites like epicurious and type your ingredients into the search box. The website will spit out a whole string of recipes for you to choose between. Chances are, you still won't have all of the ingredients required by a recipe, so you should be willing to substitute for a more appropriate, in-season vegetable or herb. 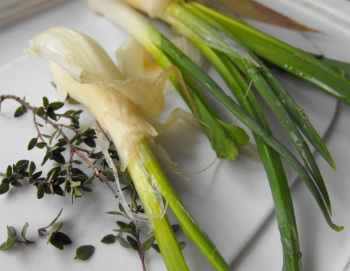 Some of my favorite replacement plants are Egyptian onions for leeks and parsley for celery since I can harvest Egyptian onions and parsley for at least 11 months out of the year. Finally, some vegetables are such good keepers that they can be considered to almost always be in season. Bulb onions, potatoes, garlic, and carrots are a few examples. You can add them to your recipes with impunity. Market your invention and become self-employed with little to no startup cash. What do you do for storage? What do you leave in the ground till you eat it? I've seen potatoes stored in saw dust or in lime powder (no rodents or other critters) and I've seen onions stored in dark closets. When I was a kid 100 lbs. of potatoes didn't last long with a family of nine counts and no accounts, but big eaters, and when growing my two kids we didn't worry about storage, but just getting it to the table. Soooooo...whats your take on storage, or grow less so you don't worry about it--LOL. I understand canning (ummm JAM!) but storage is a bit bewildering to me. 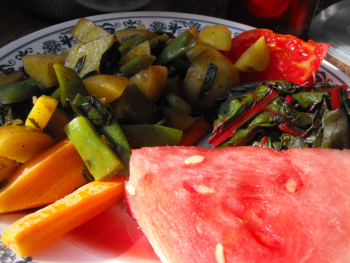 You might want to check out our storage vegetables lunchtime series. We do a lot of freezing, but last year we also started trying to grow more storage vegetables that can be eaten fresh over the winter. We found that onions, garlic, butternut squash, and sweet potatoes store just fine in a cool kitchen, and the blight wiped out our potatoes so we didn't even try to store them. We put the carrots in the crisper drawer of the fridge since it was empty, covered them with a damp towel (that I kept redampening every week), and they kept until late winter, when we ate the last one. I have high hopes that this year we will actually get potatoes, and that we will have excavated the refrigerator root cellar to put them in. What a great tip about the parsley. This is why I love your blog, I always learn something practical and doable. I'm glad you're going to give parsley substitution a shot --- it makes our meals a lot more interesting.